How To Grow Money Tree.. It has shiny green palmate leaves with lanceolate leaflets and smooth green bark. Its showy flowers have long, narrow petals that open like a banana peel to reveal hairlike yellowish orange stamens. The tree is cultivated for its edible nuts, which grow in a large, woody pod. The nuts are light brown, striped with white. They are said to taste like peanuts, and can be eaten raw, cooked, or ground into flour to make bread. The leaves and flowers are also edible. 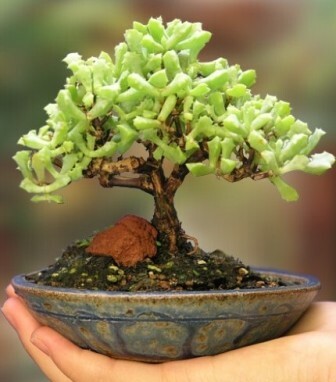 Buy this small money tree with pink colored pot and plate online @ Rs. 1800 only. 1. Fill a container with the correct soil - You should not use regular potting soil for your plant as it is too heavy for this plant to root in. 2. Allow the plant to dry out before watering. 3. Place the plant in a sunny area - Avoid placing your plant in a south-facing window, as it will probably burn. Instead, look for a place where your plant will get about 3 to 5 hours of sun each day. 4. Keep the plant neat. 1. Change the soil every two to four years. 2. Braiding must be done while the growth is young and flexible. 3. Remove side branches that disrupt the braid. Avoid getting water on the trunk, which causes stem rot.